Flir's Launch of the New MR160! FLIR's new MR160 Imaging Moisture Meter is the first of its kind. It features Infrared Guided Measurement (IGM) Technology that helps you quickly scan and target moisture issues. Equipped with a built-in thermal camera, you can review images and generate reports with FREE Flir tools software. 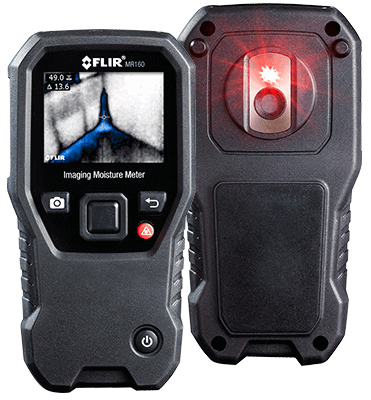 The MR160 comes with FLIR's 2-10 warranty, 2 year full product warranty and 10 year detector warranty. FLIR's new MR160 lmaging Moisture Meter is the first of its kind to feature lnfrared Guided Measurement (lGM) technology. IGM guides you to the spot where moisture has been detected to identify and validate problems fast. The MR160 provides an infrared image, both built in pin-less sensor for non-intrusive measurements, and external pin probe. This new product is due to arrive mid-late July. Be the first to stock the new Imaging Moisture Meter and pre-order yours today!